Flawless fruit and nuts from California family farms are abundant in this sophisticated, distinctive fruitcake, sure to banish this traditional treat's bad reputation forever! Filled with dried cherries, cranberries, apricots, golden raisins, pistachios, hazelnuts and pecans, each cake is aged for flavor, sweetened up, soaked in bourbon and brandy, battered, and baked. Sure to become a tradition at your own holiday table, and a beautiful gift during this festive time of year! Each cake yields 6 servings. 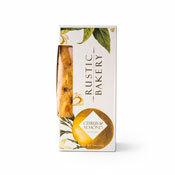 Unbleached enriched wheat flour (wheat flour, riacin, reduced iron, thiamine mononitrate, riboflavin, folic acid, enzyme), Whiskey, Brown Sugar (cane sugar, non-GMO molasses), Butter (cream, [milk], natural flavors), Eggs (eggs, citric acid), Dried Apricots (apricots, rice flour), Dried Cranberries (cranberries, cane sugar, sunflower oil), Dried Cherries (cherries, cane sugar, sunflower oil), Raisins, Pistachios, Hazelnuts, Pecans, Almonds, Orange Zest, Vanilla Extract (water, alcohol, vanilla bean extract), Sea Salt, Baking Powder, Spices.